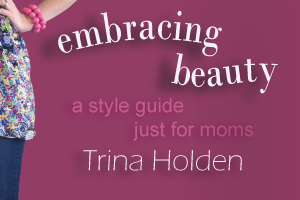 If you read my interview with Trina Holden last week, you know how excited I am that she is sharing her passion for beauty in book form. Embracing Beauty has armed me with all sorts of ideas for adapting my shopping habits and my closet to fit my every-changing momma-body. From scarves to tunics (and everything in between! ), Trina gives a new spin on old classics as she details the how and why of the staple items (and color!) in her own primarily thrifted wardrobe. But Embracing Beauty does more than just provide fashion and accessory tips that fit every body and budget. 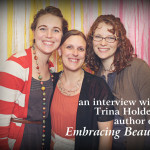 Trina Holden ignites a passion for becoming ambassadors of beauty in every area of our hearts and lives. 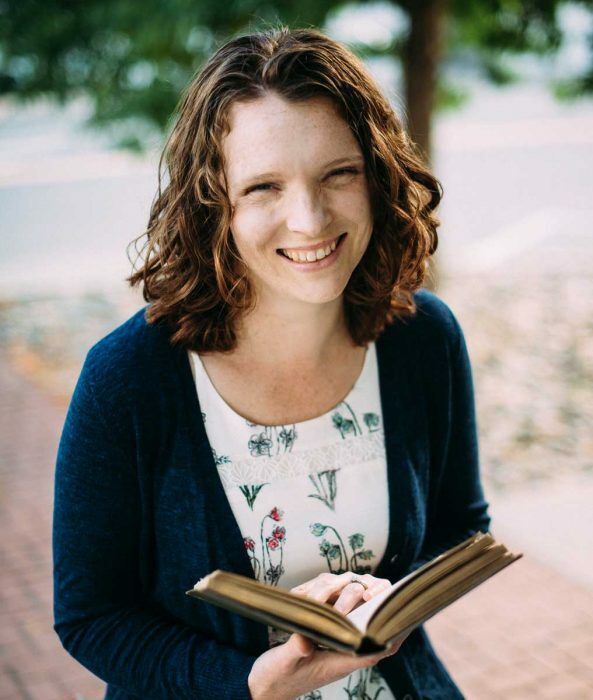 Her book is not just about what’s in our closet, but about how we view our clothes and our bodies. 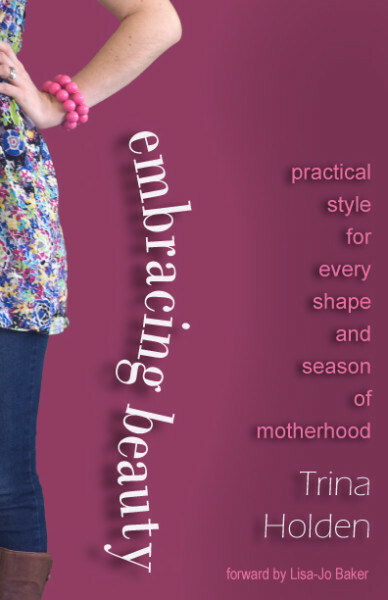 Trina’s words help us moms to see ourselves as God sees us: beautiful creations made in His image. And that’s a beauty worth embracing! 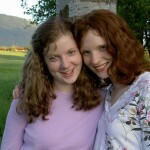 Trina was kind enough to share an eBook copy (PDF or eReader compatible file) with one of you! I’ve been paying more attention to how clothes fit. In the past I just bought a certain size because I wanted to hide what I didn’t like about my body, instead of buying clothes that actually fit. Now that I respect my body for what it is, I feel a lot better. I like to wear “public” clothes even when I’m just staying home. Also using scarves is fun! I find that when slow down to pay attention to the small details, I see beauty all around me. I like to take a few minutes to try a new hairstyle now and then to spruce myself up. I can’t wait to read this book! By enjoying the little, precious, beautiful moments- and taking the time to write about them or photograph them. also, I’ve learned to not hold onto clothes that I rarely wear or don’t *really* even like! 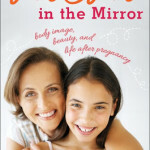 I would love to win a copy of this book, it would be helpful perspective with two little ones under 2! My most recent season has been to embrace the postpartum figure and not be all in a dither over the curves and jiggles that weren’t there before. 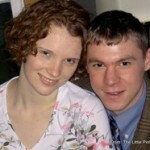 I know that this is a new and different kind of beauty, one that can be traced to the precious little girl in my arms! Oh, Annie – yes! Amen and amen. 😉 You’re gorgeous. I still haven’t quite got the hang of makeup – maybe one day I will, but I feel a bit daunted by the prospect of working out what goes where! Recently, I’ve been trying to take the time to do *something* with my hair (i.e. other than the usual pony tail) – my husband likes it when I wear it up, but my toddler is a little too fond of pulling out hairpins! For me, I’ve learned to embrace and use scarves and accessorize a little more than previously. One way I’ve been embracing beauty is by learning to wear make-up in the past few months. It was a huge no-no growing up, so it’s taken a while for my husband to convince me to come around, but now I’m loving how a few extra minutes in the morning can give my confidence a boost for the day, and bless him so much too! Also, I pierced my ears on our honeymoon (also a big no-no previously! )…and earrings are now my favorite accessory! I’ve learned to intentionally combat the lies people have told me about my body/physical apppearance with the truth that God made me absolutely perfect and i am beautiful to him, regardless of what others may say. I’ve realized I don’t have to wait to be a perfect size (whatever that is) in order to put thought and care into what I wear. Earlier this winter I got rid of the clothes I didn’t like, had a fashion show for my husband to see what went well with what. I’ld gotten a lot of clothes from my mother and sister in law that they didn’t think they’ld ever fit in again, and now I can wear my favorites all the time 🙂 A quick way to add something or make me feel pretty is to wear earrings that day.